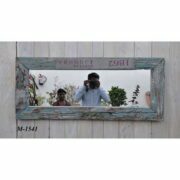 A unique mirror upcycled from an beautiful salvaged door . 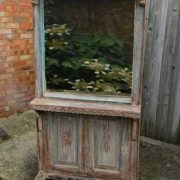 An old salvaged door has been used to create a stunning and unusual mirror. The door itself has carved wood edges and some metal banding. It can be opened with a chunky ring handle on sun shaped back plate. There is a little blue paintwork within the door. 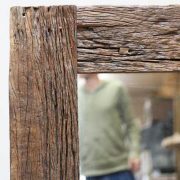 The frame has been constructed around the old door, using reclaimed timbers. There are remnants of previous paintwork, ocre and greens. 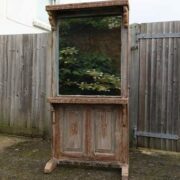 This would make a unique feature piece.